Animal Defenders International : Animals in entertainment : VICTORY! Italy has banned ALL animals in circuses! The final vote on the bill to phase out ALL animals in circuses and travelling shows took place on November 8th 2017 in the Assembly of the Italian Parliament and is now law! Rules for implementation of the new legislation to phase out all animals in circuses will be set out within one year by a Ministerial decree. Italy has an estimated 100 circuses with some 2,000 animals making this one of the biggest victories in the campaign to stop circus suffering – regardless of how long is set for the phase out. In March, ADI President Jan Creamer addressed a special workshop organised by our friends at LAV Italy at the Italian Senate, to launch the Bill. This was followed by a screening of the Italian version of our film Lion Ark. Jan and ADI Vice President Tim Phillips also spoke alongside LAV at a screening of Lion Ark at the Turin Environmental Film Festival and the film toured a number of Italian festivals. We scarcely dared believe the ban would be passed by Christmas, and it covers ALL animals, not just wild animals. 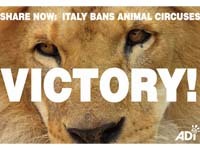 Italy becomes the 41st country to pass national measures prohibiting the use of animals in circuses. In the US, please urge your Representative to support the Traveling Exotic Animal and Public Safety Protection Act (TEAPSPA), the U.S. federal bill to ban the use of wild animals in traveling circuses. In England, call on the government to introduce their bill to ban wild animal acts – it has been sitting on the shelf for FOUR years! Contact your MP and help make it happen. In Scotland, urge your MSP to back the government bill to ban wild animals in circuses as it progresses through the Scottish Parliament. In Ireland, ask your TD to support Paul Murphy’s private members bill to ban wild animals in Ireland’s circuses, to be debated on 21st November 2017. Help ensure ADI can support campaigns to end circus suffering throughout the world - our investigations and research are vital to the progress we are seeing. Donate here. YOU can take action today, right now and YOU can make a difference to animals.